It features in the first written reference to the city, which appears in the Annals of Salzburg of 907, in association with a battle between Bavarians and Hungarians. The castle hill was populated as early as the late Stone Age; its first known inhabitants were the Celts, who founded a fortified settlement here called ‘Oppidum’. Dedicated to the Holy Saviour, from 1221. After 1291, when Bratislava was given the privileges of a town, the church was rebuilt to become part of the city walls (its tower served as a defensive bastion). The present church was consecrated in 1452. The roof of the original gothic tower, built in the mid 14th century, was modified between 1753 and 1758 to give it its current, baroque style. 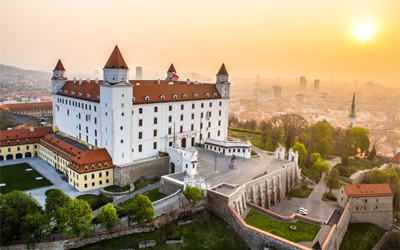 The 51 meters tall tower has seven floors, and the superb view of the old town from the upper terrace of the tower is one of Bratislava’s top visitor experiences. 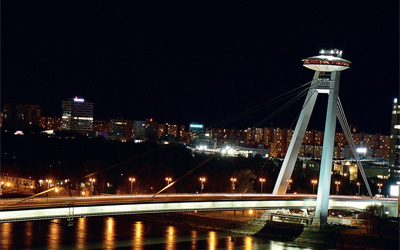 For the local people, the western part of Bratislava is one of the most popular venues for a trip. 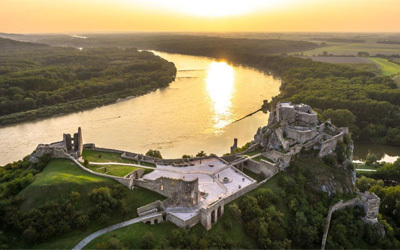 Just 10 km west of the city centre, Devín Castle is set in beautiful natural scenery. Built on the top of a high crag, it towers over the small village of Devín and the confl uence of the Danube and the Morava rivers which form the border with Austria. 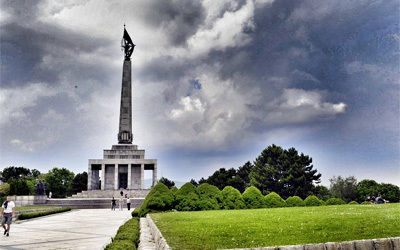 The gigantic Slavín war memorial is visible from much of the city. On a hill overlooking the castle, it commemorates the city’s liberation by the Red Army in April 1945. It is also a cemetery for 6,845 Soviet soldiers who died during the battles for the city and the surrounding region that took place in the final weeks of World War II. “Floating” on the pillar of the New Bridge (Nový most), this restaurant offers a pretty unconventional experience, from where you can enjoy a unique panoramic view of Bratislava and its surroundings from above. 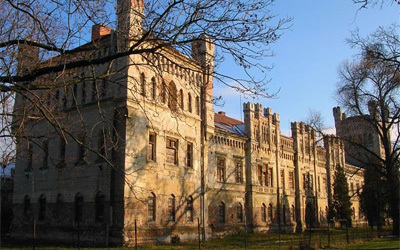 Galanta’s neo-gothic castle was built in 1633 by the brothers Daniel and Paul Esterházy during the first period of massive expansion of power and prosperity of the family. 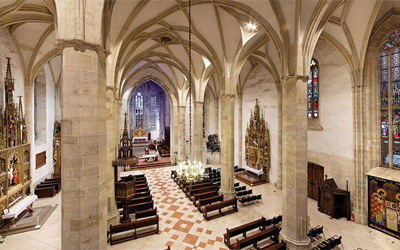 Another member of the family, Imrich, bishop of Nitra, rebuilt the object in a baroque style in 1736.